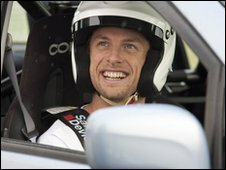 Formula One world champion Jenson Button is moving to Guernsey, his PR agency has confirmed. The reigning world champion, 30, is said to visit the island regularly to visit his agent Richard Goddard, and fellow racing driver Andy Priaulx. The McLaren driver, who is top of the championship standings, is expected to move to the island later this year. Button, originally from Somerset, visited Guernsey earlier this year to film an advert for one of his sponsors.